Just about one more week, then it’s time for my favorite season of the year! I’ve always loved Christmas, but the past few years I’ve been working crazy the weeks before and after, so the Christmas spirit hasn’t really been there as I wish it to be. As you may know I used to suffer from panic attacks as I was younger, and with everything that has been going on in my life lately I haven’t been feeling very well. When I woke up in panic this Monday, and felt my heart beating in a rushing pace I decided to call the doctor. I know I’ve been stressed out for a while now, and I know my head and body well enough to know that this meant it was time for a break. The doctor put me on the sick list, and I won’t be going back to work until the 4:th of January. It wasn’t an easy decision to make, because in one way it feels like giving up, but I also know that it was the right thing to do and it will help me come back sooner. Anyway, as I got a bit more time on my hands I’ve decided to go all in on Christmas. I will get my time to relax, and I have all the time I need to make nice wrappings, make candy and decorate for a lovely Christmas. 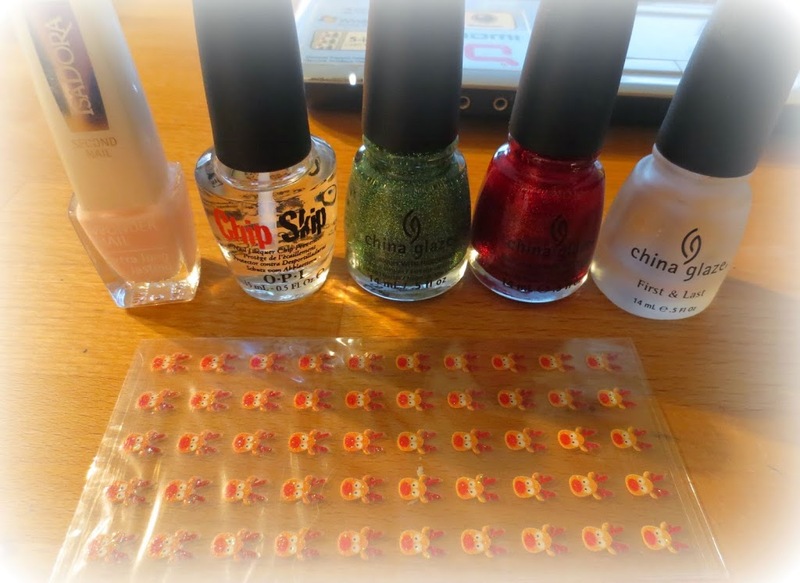 Today I’m going to show you my Christmas nail art. I found these lovely stickers from Allura in London this summer, and even though it wasn’t the right season I just couldn’t walk past them. Aren’t they lovely? For this look I’ve used Chip Skip from OPI. This was something that I found in New York that is supposed to make the nail polish last longer. Really look forward to see if it works. As a base I’ve used Second Nail from Isadora, and as a topChina Glaze First and Last. Both colours are from China Glaze as well, and are defiantly my Christmas favorites, 182 Ruby Pumps and 1261 This is tree-mendous. Love all the sparkles in them! So what do you think of my Rudolph nails? Let me know in the comments bellow! 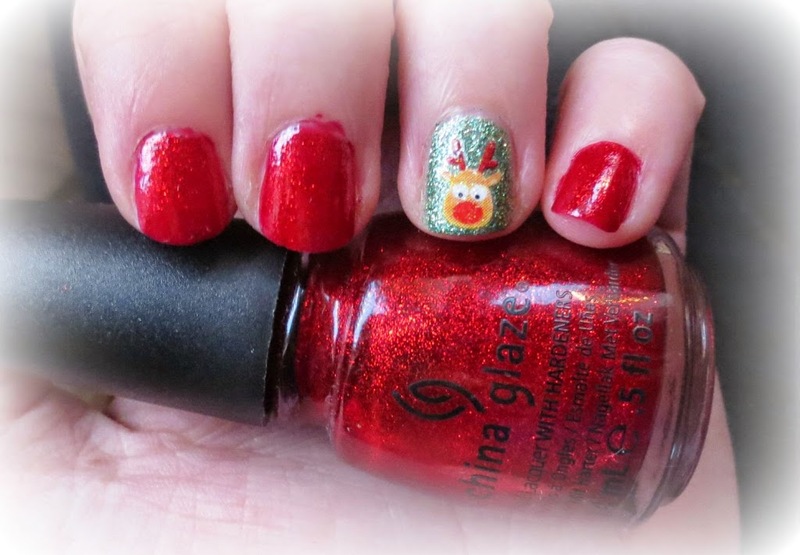 This entry was posted in Beauty and tagged Allura, China Glaze, Christmas, Nails, OPI by Anna S. Bookmark the permalink. Stunning mani Anna! Gorgeous colours! Omg how cute! Dang that’s really good! If I tried that Rudolph would probably look like a blob haha! I definitely don’t think staying off work for a bit is giving up, it’s just giving your self a much needed break! You’ll feel so much better this way I lovvee this design, the little Rudolf is so cute! Thanks for your adorable comment Anna! 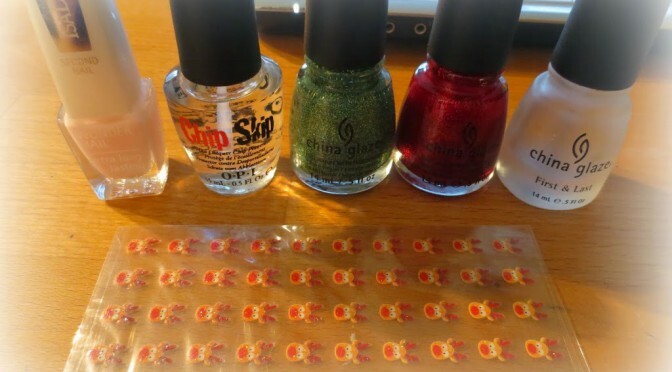 This is so cute, I was planning to paint my nails tonight and i think this will be the one!